“We’re satisfied to be able to finish off the United States the first time round. Once is quite enough. What good does it do to annihilate a country twice? We’re not a bloodthirsty people.” -Nikita Khrushchev, comparing American and Soviet nuclear capability. I’d like to extend my warmest congratulations to Mother Russia for finally winning the Cold War. Some say it’s too early to call, and that the popular majority of Americans (by 1.5 million at this point) who still think we have a leg in the race might suggest otherwise, but as it is, I think it’s safe to say that America concedes defeat. Congratulations, Russia. You win. Freedom and democracy, as it turns out, really don’t work after all. You’ve proven that much, Russia. I’ll admit, you fooled us with that whole “collapse of your very way of life” trick back in 1990. I can’t believe we fell for the oldest trick in the book, and didn’t even notice when, out of nowhere, you elect a former KGB agent to take over for Boris Yeltsin. Smooth move. We also didn’t think trolling could be a successful war tactic. In the end, your trolls really knew how to rig an election. I’m just glad Reagan isn’t alive to see this day. He would have been sorely disappointed. So, Russia, what’s next? What’s your end game? Warming the oceans and melting Greenland’s ice sheets enough to get our Cold War nuclear base? Our new president will ensure that happens. Spreading misinformation? Reducing our language to double plus good and double plus ungood? We’re already limiting our words to great or nasty. I’m sorry, Russia, but when you come for the spoils of war, you won’t find anything worth taking. By the time you reach us, we’ll have run the continent into the ground with oil spills in our largest rivers, Midwestern earthquakes from fracking, dust bowls, forest fires, and uranium mining accidents. By the end of the Cold War, we killed off 93 percent of our varieties of fruits and vegetables, and who knows how many we’ve gotten rid of since then. Do you want our healthcare? It’ll be cut. Do you want our Space program? We’ve been defunding it for a while now. Do you want our agriculture? One blight and our corn will be gone in a few months. Dearest Russian overlords, we are now ready for your conquest, but I will not say we are ripe for the taking, because as a nation we are actually rotten to the core, entrenched in racism, misogyny, anti-intellectualism, Evangelical opposition to science, the comfortable idea that we can actually survive the catastrophe of ourselves if we just buy the necessary tools. America’s value has depreciated so much that you won’t find anything worth conquering. Keep in mind that we’re taking you with us, in the end. Mutually Assured Destruction never looked so appealing. So congratulations, Russia. I await your rule. This entry was posted in History, Philosophy, Theology, Aeasthetics, and Politics, Writing and tagged 2016, American Politics, climate change, Cold War, Election, Geopolitics, History, humor, Russia, Satire, U.S., Winning the cold war on November 20, 2016 by keeneshort. Some of the best advice I received about historical research is that oftentimes the surest way to find sources is to have boots on the ground and look for sources in person. This usually involves going into public archives or getting access to private ones, but I’ve heard tales of finding rare documents forgotten in the trunk of a car or simply on display in a book fair. This week, while visiting family in Appleton, Wisconsin, I decided to experiment with boots-on-the-ground-history. I discovered that historical research is more than just skimming through a few letters. It’s detective work, a methodological investigation, and I did not rise to the challenge. As I prepare to go to graduate school to study creative writing, I worry that I may leave history behind. History is close to my heart, but requires a patient diligence. The challenge of in-person research yielded a few interesting results. Appleton’s public history emphasizes its positive qualities, such as the fact that magician Harry Houdini claimed it as his hometown, though he was born in Hungary. There is a museum with an entire floor devoted to Houdini’s life and work. However, another famous man claimed Appleton as his hometown, Senator Joseph McCarthy, who engaged in congressional witch hunts during the early 1950s to remove suspected communists. Popular opinion has since turned against McCarthy, but as journalist Edward R. Murrow said in an open challenge to the Senator’s unethical methods, “He did not create this situation of fear, he merely exploited it.” Now that McCarthy is remembered as an aggressive demagogue, his hometown has taken a statue of him that once stood in public view and placed it in a museum’s bottom floor, under the stairs. Apart from some obscure anti-communist propaganda, one from 1950 and the other from 1967, a World War One Dough Boy memorial statue and a Civil War memorial statue, I could not find any major historical documents in Appleton’s history, simply because I did not look that hard. It is not surprising that they hide McCarthy’s image and highlight a still-popular celebrity. Any research on the Cold War in Wisconsin daily life would require interviews with those who remember it, access to radio and news archives, local newspapers, and other hidden sources. Perhaps I might be able to dig up a few rare pieces of propaganda if I looked deeper, or uncover a story of Cold War espionage, but such research requires more time and energy than I can offer. I’m not a specialist, or a driven detective. I am, for the time being, only an interested amateur. Perhaps I can one day conduct better historical research. Perhaps I will one day dare to dig deeper, open doors that should not be opened, find people who have answers. I was inspired by a year-old article about Amor Masovic, who has been looking for burial sites from the Srebrenica massacre in Bosnia-Herzegovina, in 1995. That massacre, part of the Bosnian Genocide, was the first act of genocide on European soil since the Holocaust, and one that the world ignored for years. Today, the perpetrators still live side-by-side with the families of the victims, and reconciliation is a great challenge. But Masovic pursues burial grounds, is still looking for the missing victims to piece together the community of Bosniak Muslims that existed before the massacre. He’s been working for nearly twenty years and there are still bodies unaccounted for. Will I ever be such a researcher? Will I ever contribute to as admirable an effort as Masovic? It’s unlikely, but I do not want to leave history behind. I’m too compelled and too haunted by its ghosts to allow myself to give it up completely. History truly is obsessive, and maybe the only way to make a difference is to simply embrace that obsession, dig my boots into the ground, and dig as deep as the past will allow. This entry was posted in History, Photography, Reflection, Travel and tagged America, American history, Appleton Wisconsin, Bosnia, Civil War, Cold War, Edward R. Murrow, historical research, Historiography, History, Joseph McCarthy, photography, Public History, research, Srebrenica, Wisconsin, World War One on July 8, 2015 by keeneshort. Twenty-five years ago today, in 1989, on an East German news conference Politburo Günter Schabowski of the ruling Socialist Unity Party of Germany (SED) announced that East Germans would be allowed to cross over into West Germany that evening. The Berlin Wall had divided the city since 1961, and crossing from one side to the other was strictly enforced. Schabowski had, in fact, made a mistake; he was not supposed to announce to the public that they could cross the border immediately. The border guards were supposed to have been informed first so they could prepare. Instead, an enormous crowd gathered at the Berlin Wall. The guards, not knowing what to do, first prevented them from crossing, but eventually gave in opened the gates. 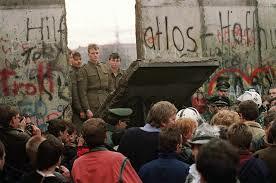 The Berlin Wall coming down, piece by piece. Toward the end of the Cold War, the Berlin Wall became a popular symbol for the war itself: it divided an otherwise united people, an otherwise united city, along arbitrary lines. It represented the division of people because of politics, though in reality it divided families, friends, and colleagues. Its fall only illustrates the futility of the Cold War, the unneeded division of society between the communists and capitalists with nothing between. Some see its fall as miraculous; others attribute it to the political efforts of western leaders such as President Reagan and Soviet reforms from Mikhail Gorbachev. For many Germans, it was a sign of positive change. Photo of a burned synagogue in Munich, November 1938. On this same day, in 1938, the Nazi SA Paramilitary force and numerous German citizens instigated a massive pogrom against Jews in Germany and Austria. Known today as Kristallnacht, Reichskristallnacht, or the Night of Broken Glass, it was a collective assault against Jewish communities. 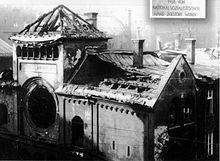 Citizens and paramilitary members burned and destroyed synagogues and businesses owned by Jews, and attacked, arrested, and in some cases killed Jews. German police and military authorities did nothing to prevent, mitigate, or bring justice to the event. As World War Two broke out the following year, Nazi atrocities only grew and became worse. Commemoration is an important part of history, but it can also be one of the trickiest parts. Public history plays an important role in commemorating twentieth century German history not only for German historians but for world historians as well. For many Americans, remembering the fall of the Berlin Wall is both easy and popular. Americans can look to President Reagan’s famous challenge to Gorbachev to “tear down this wall,” and can look to President Kennedy’s declaration of unity with the German people when he said “Ich bin ein Berliner.” The US had direct political connections to the Berlin Wall, namely an interest in seeing it collapse. Americans do not have a similar connection to Kristallnacht. The US did not have an invested interest in protecting the Jews of Europe or in preventing the Nazis from committing ruthless persecution and extermination of minorities in Europe. That itself is the problem. The US government did not make a concerted effort to stop the Holocaust until Allied forces stumbled upon concentration camps in 1945, so for many Americans, remembering the Holocaust also forces them to remember that the US government, at one point in its history, was firmly silent. 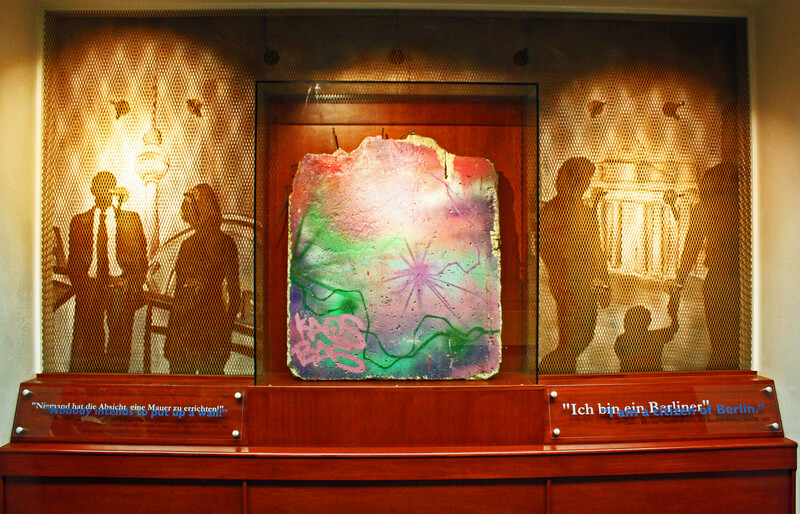 A piece of the Berlin Wall on public display at Northern Arizona University. While today, many Americans will feel good about the collapse of the Berlin Wall and think fondly of Reagan and Kennedy, very few Americans will think of the Holocaust at all. It is important to remember the advances toward justice in human history, and the collapse of the Berlin Wall represents the literal and figurative destruction of barriers separating nations and peoples. However, it is also critical to remember the moments in history when humanity failed, moments when people created divisions rather than dismantle them. November 9 marks both kinds of events, and they deserve equal commemoration in public spheres and private meditations. This entry was posted in History and tagged Berlin Wall, Cold War, German history, Germany, History, Holocaust, Kristallnacht, Public History, Ronald Reagan on November 9, 2014 by keeneshort.